But this is perhaps unnecessary. Some stocks will lose. Others will win. A decent portfolio return can be managed even if some stocks go all the down. No? Update: We had to fix some errors in this post. But the error wasn’t in the conclusion, which gets even stronger with the corrected data. We decided to run a little experiment. If you had equally invested a capital of Rs. 10 lakhs divided equally in all the stocks of the Nifty Index on 3-Oct-06 – about 10 years back – and decided to take a break like Bond Baba, where would you be today? 6 stocks have been removed and crawled their way back to the Index. 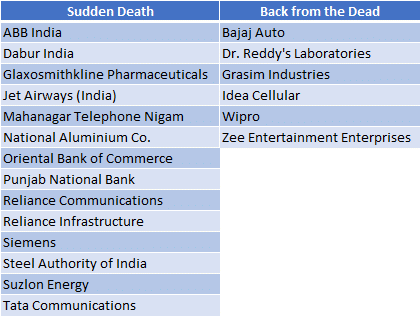 Here are the stocks that either were permanently removed from the Index “Sudden Death” while some that were killed, made their way back from the grave “Back from the Dead“. Hit by scam from its founder Ramalinga Raju, Satyam Computer Services was merged with Tech Mahindra . Ranbaxy was first acquired by Daiichi and then sold to Sun Pharma. The government owned IPCL was sold to Reliance Industries and eventually merged with it. Bajaj Holdings & Investment demerged to form 3 new entities i.e. Bajaj Auto Limited, Bajaj Finserv Limited and Bajaj Holdings & Investment. Phew, But What Did I Make? If you had invested then and looked at your P&L now, you would have over 15 lakhs from an investment of 10 lakhs on 3-Oct-06. This would have translated into a return of 164.7%. Sounds Hot? But what if you just bought the Nifty (through an ETF perhaps) and stayed put? On 3-Oct-06, the Index closed at 3569.6 and the corresponding close for 5-Oct-16 was 8743.95 points. This means that the Nifty Index has returned 144.96%. Beat this: A blind purchase of all stocks in the Nifty 10 years ago still beat the returns of the Nifty. But obviously we can’t say this happens all the time; we’d have to test different time frames (10 years, 5 years etc) and different start and end points). This is not the point we want to make. The point is: Most of your money was made in the big winners – so much that they overrode the losers, to even beat index returns in the meantime. So when some stocks go to zero, don’t fret! Three stocks lost over 80% in absolute terms. Three more stocks lost more than 40%. A Further five other stocks saw their stock prices contract (sub-zero-percent returns) in the last 10 years. That’s 11 stocks out of 50 that gave you returns lower than zero! And yet, you beat the index. We haven’t considered dividends (which would enhance your return). Or buy-backs – for instance, Ranbaxy shares were bought back by Daiichi at Rs. 737 each in 2008, which was for nearly 40% of the shareholding. Or any rights issues – Tata Steel and all the Zee companies had many. That would have been very good intermediate cash flow. But we haven’t considered any of this, for a fair comparison with the index. 14 out 50 stocks invested in Oct, 2006 are no longer part of the Index. The Index does churn a lot. The biggest profit was made in Sun Pharma – which went up 9x in this time, from an effective Rs. 94 then (there were splits and bonuses) to Rs. 759. Even though it’s down about 30% from it’s peak. BPCL too was up 7x, as the government slowly freed the company from being a subsidy recipient. And nearly that much was HDFC Bank, with a 500% return. Dabur has grown over 500% [from Rs. 46 to Rs. 283]. And guess what: Dabur isn’t part of the Nifty today. 2 other stocks that left the index and still gave triple digit returns: Siemens at 137.62% [from Rs. 530.8 to Rs. 1261.4] and GlaxoSmithkline at 133.12% [from Rs. 1,233 to Rs. 2,874.6]. On the negative end stood Tulsi Tanti’s Suzlon Energy which has lost 95% of the invested value closely followed by the Government controlled Mahanagar Telephone Nigam [-87.29%] and Reliance Communications [-86.63%]. Tata Steel continues to suffer from its horrendous Corus acquisition – negative returns after 10 years. Satyam’s scandal hurt the company a lot and for shareholders since 2006, there’s only been value erosion. Who Beat Inflation or Even Risk-Free Returns? Note that at 8% risk-free returns – your Rs. 100 will become Rs. 216. That means if you got 116% returns in the last 10 years, you didn’t do anything great – you could have got that in a liquid fund, most likely. Only 25 of the 50 Nifty stocks in 2006 have beaten inflation. Half your stocks gave sub-standard returns. There is a real story too. In 1997, a person we know had a portfolio of about 20 stocks. Stocks you’ve probably never heard of like Montari Agrochem and Parasrampuria Synthetics. Some had pedigreed owners too. About 14 of those stocks are now dead. The person never sold those stocks – well, maybe a little here and there. And that portfolio has returned about 40x or so during this time – which is about the same return given by the best mutual funds since then, and way more than the Nifty. In fact, with dividends and buybacks, it’s probably even higher. Dividends alone give as much money as about half the portfolio was worth in 1997. If you have a strong portfolio, don’t fret that a few stocks lose a lot of money, even 90%. If you don’t have the time to analyse stocks all the time, you are likely to lose when bad news hits – and yes, it’s okay to lose some. Don’t sell your winning stocks – they make up all that fantastic return, and even 8x or 9x is possible, even in Nifty stocks. The biggest returns will come from the strangest of places. No one would have thought the best returns of the last 10 years were in Sun Pharma and Dabur and the government owned BPCL. We keep saying that you should cut your losses and let your winners run. Perhaps this is a reality check for us too. Cutting losses is good – it frees up space in your portfolio, but you have to let the winners run. Many of these multi-baggers saw big drawdowns through their run, and getting frustrated would have been a disaster. The point is not to say that buy and hold wins (this is just one data point, we’d need a lot more). But it is to say that don’t let the losers make you miserable. And, given what’s happening on twitter nowadays, that statement goes well for life in general.